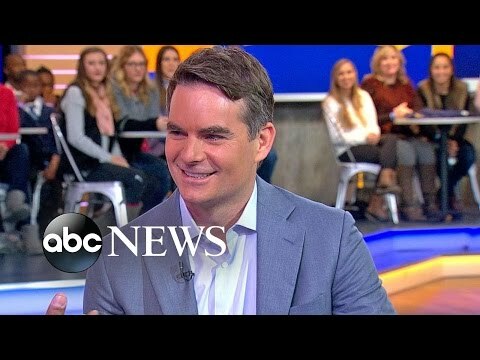 www.jeffgordon.com "Jeff Gordon: His Dream, Drive & Destiny"
Four-time NASCAR Cup Series champion Jeff Gordon, one of the most iconic names in racing and pop culture, joined FOX NASCAR in 2016 as a full-time race analyst. Gordon, who sits third on NASCAR’s all-time wins list with 93 victories, stepped into the FOX NASCAR booth alongside play-by-play announcer Mike Joy and analyst and Hall of Famer Darrell Waltrip only three months after his final NASCAR SPRINT CUP SERIES start in the legendary No. 24 Hendrick Motorsports Chevrolet. Gordon’s sixth-place effort in his final race secured a third-place finish in the series standings, making him one of only a few athletes to retire at the pinnacle of their respective sport. The California native, one of the most versatile drivers of his era, is credited with helping take NASCAR mainstream in the 1990s. Gordon changed the face of NASCAR, shattering stereotypes and drawing legions of new fans with his talent, poise and polished appearance that also made the sport attractive to Madison Avenue. In his 24 years of full-time Cup Series competition, Gordon served as one of NASCAR’s most effective and committed ambassadors. Gordon drove for Hendrick Motorsports for his entire Cup Series tenure, from November 1992 through November 2015, winning four Cup Series championships (1995, 1997, 1998 and 2001), 93 races and 81 pole positions, and scoring 325 top-five and 475 top-10 finishes. With his first title in 1995, Gordon became the youngest champion (24) in NASCAR’s modern era in only his third full season. He ranks third behind only NASCAR Hall of Fame drivers Richard Petty (200) and David Pearson (105) in all-time victories, is a three-time DAYTONA 500 champion and record five-time BRICKYARD 400 winner. Gordon holds the record for most consecutive seasons with a pole (23), among numerous other accolades. Furthermore, he is NASCAR’s winningest road-course driver with nine wins and is the all-time leader with 12 restrictor-plate track victories. In September 2015, Gordon set a record for most consecutive starts with his 789th race, breaking Ricky Rudd’s mark of 788 and joining the “iron man” company of legends such as Cal Ripken Jr. and Brett Favre. Gordon retired with 797 consecutive starts, a journey that began with the 1992 season finale at Atlanta Motor Speedway as Petty brought his racing career to a close. In preparation for his role as FOX NASCAR analyst, Gordon served as a race analyst for FOX Sports’ coverage of three NASCAR XFINITY SERIES in 2015. His move to the FOX booth furthers a career in which his affability and crossover appeal have provided him numerous high-profile television and movie opportunities that include: becoming the only auto racing driver ever to host Saturday Night Live; co-hosting Live! With Regis and Kelly more than 10 times; appearances as himself on The Simpsons, Spin City and The Drew Carey Show; TV appearances on Late Show with David Letterman, The Tonight Show with Jay Leno, Jimmy Kimmel Live! and Sesame Street; and participation on television’s Celebrity Poker Showdown and Who Wants to Be a Millionaire: Sports Edition, among others. Gordon also voiced the character “Jeff Gorvette” in the animated film Cars 2. Gordon's first authorized biography, Jeff Gordon: His Dream, Drive & Destiny, released in November 2016. The book was written by Joe Garner with a foreword by Tom Cruise. Off the track, Gordon, named one of “NASCAR’s 50 Greatest Drivers” in 1998, established the Jeff Gordon’s Children’s Foundation in 1999, which supports pediatric cancer research, treatment and patient support programs and has granted more than $16.5 million to support children battling cancer. The Jeff Gordon Children’s Foundation provided primary funding to establish the Jeff Gordon Children’s Hospital (JGCH) in Concord, N.C. The Jeff Gordon Children’s Foundation provided $1.75 million to establish the Butaro Cancer Center of Excellence (BCCE). Working in collaboration with Partners in Health, Dana Farber Cancer Institute and the Ministry of Health of Rwanda, BCCE opened its doors in July 2012 and has treated more than 5,000 patients who otherwise would have no access to care. In 2011, Gordon was invited by President Bill Clinton to join the Clinton Global Initiative (CGI). Gordon was honored with the National Motorsports Press Association (NMPA) Myers Brothers Award in 2012, recognizing those who have made outstanding contributions to the sport of stock-car racing. That same year, he received the Heisman Humanitarian Award, established to recognize those in sports who give significantly to communities and improve the lives of others. At the industry’s December 2015 NASCAR Sprint Cup Series Awards in Las Vegas, Gordon received the illustrious Bill France Award of Excellence.